Do you want to catch more crabs when you go crabbing? In this site you will find some helpful crabbing tips to get more crabs in the basket and on your table. Whether you're just starting out or you've been crabbing for years, these tips will help any recreational crabber catch more crabs in less time. As with any hobby or sport, the game changes through the years. There are innovative products that are developed that help you get better at what you love to do. There are also changes in the nature of the sport due to natural causes or by laws and guidelines. I created this site to show you how to use the latest innovative products combined with tried and true methods that I have learned through my years of experience as a recreational crabber. I want to help you catch more crabs by using the tools and techniques described on this site to make your day out crabbing more enjoyable and productive. 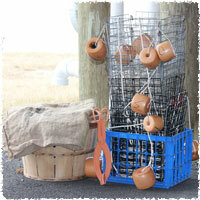 This site is often updated, so keep checking back for new tips on how to catch blue crabs. When I find something that helps bring in more crabs, I add it to the tips section. Have fun and good luck crabbing!